Home-enthusiasts on the hunt for sophisticated living spaces in Chennai may be interested in Dra 90 Degrees, the latest presentation by Dra. The residential complex has been developed in Kovilambakkam and promises quality living facilities to the residents. Chennai has always attracted homeowners, due to its commercial importance and enriched social infrastructure. The residential complex has got 2/2.5/3 BHK apartments, with prices ranging between INR 58.38 lakhs and INR 91.11 lakhs. If you are keen on acquiring quality homes in Chennai, you have a good opportunity now. The estate has attracted investors from various cities in India. The demand for quality homes in the area is high. The Dra 90 Degrees price is likely to rise in the coming years. Investors and homeowners willing to invest in the property should make their move now. The returns on selling residential property in Chennai is high. You can strike a lucrative deal by investing in the project now. The apartments are large and elegant. The wide balconies and large windows in these apartments ensure optimum ventilation and the flow of natural light in the interiors. If you have a fascination for green living facilities, you can find a suitable abode for yourself here. 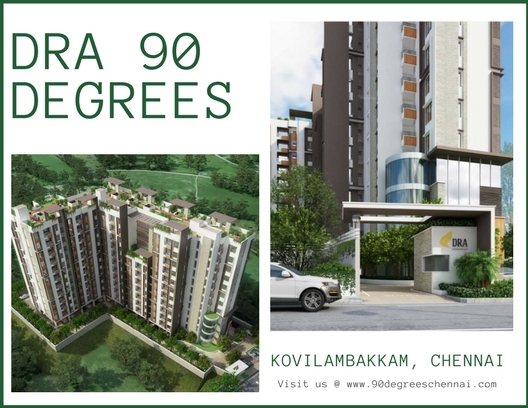 The sophisticated interiors enhance the quality of living in Dra 90 Degrees Kovilambakkam. A carefully designed floor plan ensures maximum utilization of the available space in the complex. A large section of the estate has been dedicated for public use. The residential complex comes with beautiful, landscaped gardens. The extensive green areas in the complex will blow your mind. The transportation system in Chennai is well-developed. Lately, the roadways and transportation facilities in Kovilambakkam have been upgraded. The residents can easily reach the desired destinations through the well-connected roadways in the city. The commercial areas can be reached in quick time from the estates. Besides, Chennai has been known for its enriched commercial infrastructure. A number of blue-chip companies are expanding to the city. Residents in the residential complex will enjoy the tremendous employment potential in Chennai. This is one of the reasons behind the high demand for residential property in Chennai. You will have immense entertainment facilities when you move to these apartments. A large number of restaurants, bars, shopping malls and multiplexes are located close to the residential complex. The education and healthcare facilities around the residential complex are also well-developed. The important schools in the area include Prince Matriculation Higher Secondary School, Vel's Vidyashram Senior Secondary School, Modern Senior Secondary School, Sunshine Chennai Senior Secondary School, New Prince Matriculation Higher Secondary School, APL Global School, Trileaves International School, D.A.V. Public School, NPS International School, Guru Nanak Matriculation Higher Secondary School and The Indian Public School. The prominent hospitals in the region include Avinashhospitals, Bharat Hospital, B.M. Hospital, Chennai Krishna Hospital, Parvathy Hospital, Prashanth Super Speciality Hospital, Gleneagles Global Health City and Shadithya Hospital. Investors and homeowners willing to buy property in Kovilambakkam should go for this residential complex. This is the right time to invest in these properties, as the prices are likely to rise in the coming months. Enjoy the luxurious apartments and comfort in the exotic residential complex in Chennai. DRA Homes – Shining Brightly at map of Indian Realty! The company has a collective industry experience of over 100 years and opulent expertise across various functions of real estate development. All of which come together to enchant NICE to our employees, vendors, customers and other stakeholders. From being the forerunners of apartment complex concept in Bangalore to South India’s first ever townshipdevelopers, the illustrious company has proven its proficiency, and made an indelible mark across the cities of Chennai, Bangalore, Goa and Mysore. The objective is to achieve the company’s policy by imparting the specified product to our customer with right quality as per the delivery schedule and at an granted price and also to bring awareness of our policy among various classes of employees so that they shall be dedicated towards running a system driven company. At DRA Homes, they believe that the actual journey begins only after reserving your apartment. In their attempt to serve you better, they have planned out the after-sales process which we believe would be valuable to you after booking your apartment. Pile Foundation and Single Basement as per Structural Design. Structure as per Seismic Zone 3 compliance with blocks as per design. Antiskid Tile flooring and skirting for Bathroom, Utility and Balcony. Top range Bathroom Sanitary and CP fittings from Kohler. Hydro-pneumatic pressure system for constant water pressure on all floors. Laminated Wooden flooring in the master bedroom. Phoenix Market city and Grand mall are located very close to the project for shopping, dining & entertainment. Easy to reach Chennai International Airport. Convenient access to Guindy, Adyar, OMR, Medavakkam & GST Road. Near 24*7 Hospitals such as DR. Kamakshi Memorial Hospital. There are many factors to be considered while choosing a home.